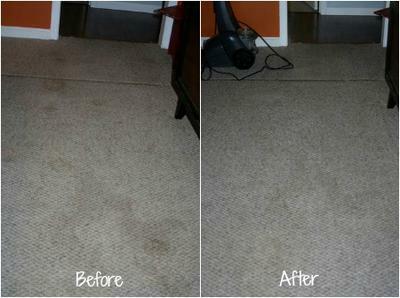 Here's before and after pictures of pet stains on carpet, shared by Possum2. These spots were caused by both rabbit feces and dirt. These types of stains can be some of the toughest to remove, especially once they get ground into the carpet with time and movement. If they are fresh you can often spot clean the surface. 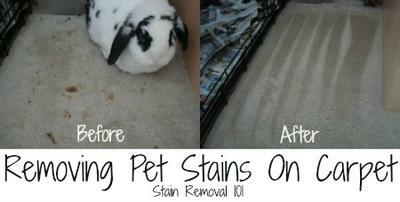 Here's instructions for removing feces stains and also for dirt stain removal. However, as you can see from the before picture this wasn't just one little spot, but all over the whole area of the carpet. In such a situation is is often better to clean the whole carpet instead of just spot cleaning. A home carpet cleaner will often work quite well. In this instance she used the Bissell Little Green Compact deep cleaner, and as you can see from the after picture it worked quite well for her. How do you deal with carpet pet stains? I'd love to hear your tips and home remedies. You can share your tips here or read others that have already been submitted. We have multiple pets and often adoptees so we have had our share of accidents. While I love animals I do not tolerate accidents in the house! Over the years I've found a few simple tricks to both clean and eliminate their desire to repeat offenses. One of the biggest attractions for dogs and cats is smell .... so the key to keeping your house clean is to elimate the odors - ALL ODOR - even though you can't smell it, they can. So we follow a few simple steps. First, soak up (or pick up) as much of the accident as possible - this is important. If it's wet, it may and probably has soaked into the carpet pad below - it must be cleaned as well! So place a towel or bundles of paper towels over the stain and stand with all your weight on one foot for several seconds and keep repeating until no moisture is found on the rag. Second, liberally spray hydrogen peroxide over the stain (it needs to soak through the carpet and into the pad). We use a hand held spray bottle - the vet uses the garden sprayer - either will do. Let stand a few minutes and follow the same steps as above until all moisture is removed again - repeat until towels are completely free of any color. Third, then liberally spray with rubbing alcohol (again with enough to reach the pad below) - let this sit for several minutes, 30 minutes or more is best. The alcohol will evaporate some and kill all remaining germs as well as the odor that comes with then. Fourth and final step, to be used as needed. For cat stains (and very strong dog odors) Consan Triple Action 20 will completely eleminate any odor. Mix a spray bottle with 1 part Consan, 15 parts water and spray generously. This works on carpets, front porches, cars, or any place a cat may have left his delightful (or not so delightful) scent. I learned the trick from a local vet. 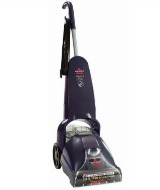 Their offices always smelled fresh and never doggy - the key - Consan Triple Action 20 to floors and surfaces each night! This can be found in the garden center - it's a fungicide! Thanks so much for these great tips Diana. I would just suggest a bit of caution to anyone who is doing the last step, with the Consan Triple Action 20 on carpet -- I looked into it and it says it can be used on hard surfaces. Therefore, if you choose to use it on carpet it may have unintended consequences, such as harming your carpet fibers. Before using it on carpet I would suggest testing it first in an inconspicuous area to make sure it will not harm your carpet! 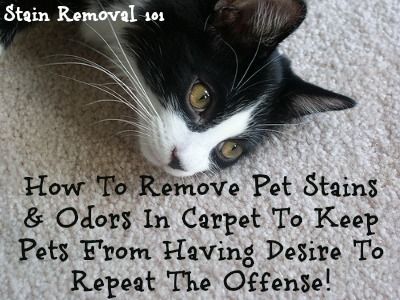 Pet stains and odors often go hand in hand. I would love to hear from more people who have tips for dealing with these odors in their carpet. You can share your odor removal tips here or read others that have already been submitted. Here's a before and after picture from "ThriceMOM" who had tried, unsuccessfully over time to spot clean various spots on her carpet where puppy potty training had taken place. While cleaning up various spots may be the most time efficient thing to do, at the time at least, periodically it may be best to just clean the whole carpet instead of just little sections as disasters occur. You can have it professionally cleaned, or you can use a carpet cleaner. In this case ThriceMOM used a Bissell deep cleaner to get the job done (see exact type described on the right). The after picture shows how much improvement there was to the carpet after only one pass with the carpet cleaning machine and some cleaning solution. It obviously made quite a difference, doesn't it? How do you clean up your pet's messes in your home? You can share your tips here, or read others already submitted. 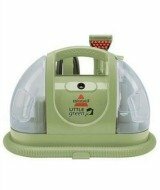 In addition, if you'd like to get your own machine for cleaning carpets, I've got a lot of reviews already on the site. You can check out reviews of home carpet cleaners here, or share your own. Soak the stain with vinegar and then add baking soda. It will fizz up, let set for a couple of hours, and then dab it up with a cloth. For the older stains it may take a couple of tries to get all of it. Works well on pet stains too.